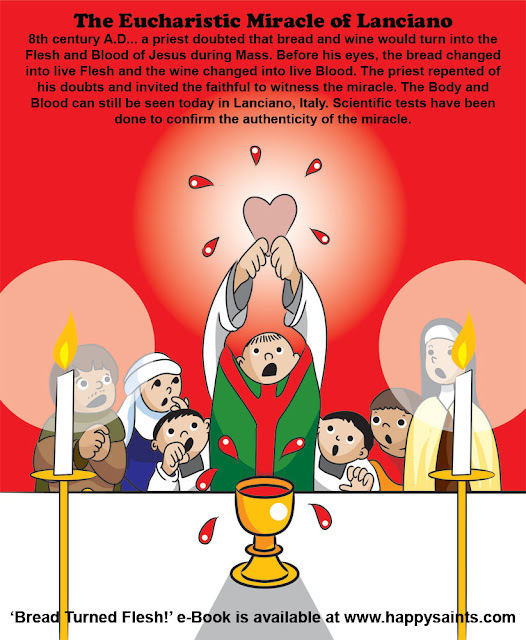 8th century A.D... a priest doubted that bread and wine would turn into the Flesh and Blood of Jesus during Mass. Before his eyes, the bread changed into live Flesh and the wine changed into live Blood. The priest repented of his doubts and invited the faithful to witness the miracle. The Body and Blood can still be seen today in Lanciano, Italy. Scientific tests have been done to confirm the authenticity of the miracle.